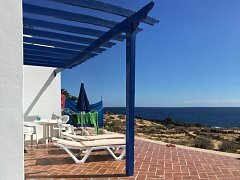 The small naturist seaside resort Charco del Palo offers you everything you are looking for in your holidays, during the most beautiful time of the year. The famous Famara Beach situated in the north of Lanzarote is probably the most exciting, savage and most beautiful beach of the whole island. ...both are located on the eastern coast of Lanzarote, with a sandy beach, two small, cozy, spanish fishing villages, almost originally preserved. Villas and apartments in the mystical landscape of Lanzarote, with its palm trees, volcanoes, vineyards and more. Do you prefer an economic, small car, or a SUV? A convertible or a minivan? Good conditions at low prices ! We assembled these pages for you, so that you will have some basic tourist information for your holidays on Lanzarote. Since almost 40 years Charco del Palo is one of the most favourite naturist resorts, and not only on Lanzarote! Out of the way of mass tourism you will enjoy wild, almost untouched nature - throughout the whole year! Black lava meets the atlantic and at times you can see a breathtaking spectacle when the breakers run against the coast. But of course you can go in and out the water safe and sound.